Former Gov. 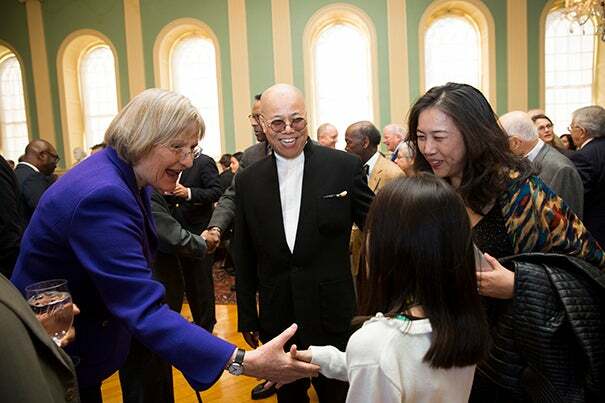 Deval Patrick (from left), Harvard President Drew Faust, Michael D. Smith, the Rev. Wendel “Tad” Meyer, and artist Yuqi Wang unveiled Wang's portrait of the Rev. Professor Peter J. Gomes. As the Plummer Professor of Christian Morals and Pusey Minister at Memorial Church for nearly 40 years, the Rev. Professor Peter J. Gomes attended countless meetings in the historic Faculty Room in University Hall. Not only that, but Gomes played a major role in preserving and curating the room, which is filled with portraits of bygone Harvard presidents and professors, hanging on sea-green walls. He was one of three curators who oversaw renovations in 2000. That’s why the unveiling of his portrait at a ceremony led by President Drew Faust Thursday was a kind of homecoming. Faust offered a warm tribute to Gomes, a Baptist minister who served five Harvard presidents until he died five years ago at age 68, describing him as a man who “was not to be forgotten or ignored” for his kindness, frankness, and devotion to both teaching and preaching. One of Harvard’s most celebrated figures, Gomes was also renowned for his wit. 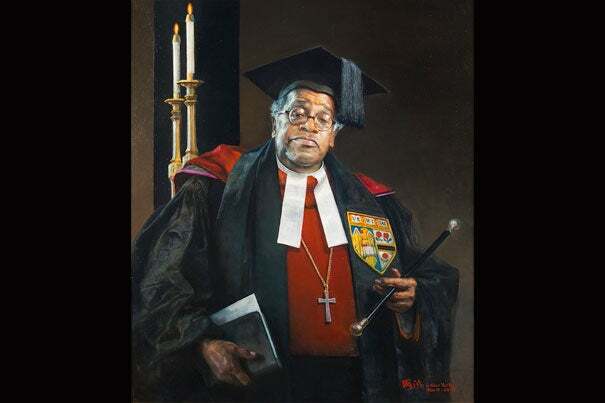 The portrait, by Chinese-born artist Yuqi Wang, shows Gomes, who held posts in both the Divinity School and the Faculty of Arts and Sciences, in full regalia, with a graduation cap and formal robes, and wearing the shield of the Memorial Church. He holds a Bible in one hand and in the other grasps the baton with which he led every Commencement he attended. In the portrait, it seems he might be about to say something funny or shocking — or both. The portrait hangs above Gomes’ seat at faculty meetings and joins those of poet Henry Wadsworth Longfellow, President Charles William Eliot, who transformed the College into modern Harvard, and the great mathematician Benjamin Peirce, along with nearly 40 other Harvard notables. Gomes’ portrait is the room’s first of a person who is not white. The unveiling came two decades after the first portrait of a woman was hung, in the 1990s. The first woman was Helen Maud Cam, who was also the first woman tenured at Harvard. Then came portraits of Cecilia Payne-Gaposchkin, who was the first person to receive a Ph.D. in astronomy from Harvard, and Elizabeth Cary Agassiz, the co-founder and first president of Radcliffe College. Former Massachusetts governor Deval Patrick ’78, J.D. ’82, and the Rev. Wendel “Tad” Meyer, who was acting minister in the Memorial Church after Gomes’ death, also attended the dedication. Patrick developed a close friendship with Gomes during his time at Harvard. A longtime Republican, Gomes turned Democrat to support Patrick in his election as the first black governor of Massachusetts. Gomes’ portrait, said Patrick, will help to display and preserve his qualities as “loving, whimsical, and wise,” and will serve as a constant reminder of the value of seeing life with fresh perspectives. Faust said that there was never anyone quite like Gomes. She recalled one of his sermons to graduating seniors, in which he urged them not to allow others to finish their sentences and not to get caught in the trap of expectations. She also remembered when Gomes paid her a visit to congratulate her after she was named president of Harvard. “He arrived in church regalia, swept in, and announced, ‘Madam, I come to pledge my fealty,’ ” Faust said, drawing laughter from the crowd. Gomes’ editor, Cynthia Rossano, who attended the ceremony, couldn’t have agreed more.